If necessary, you can modify the opacity of layers. 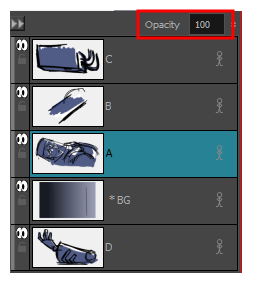 NOTE Layer transparency is not supported when exporting to the Toon Boom and/or FBX formats. Select the layer whose opacity you want to modify. Type in a new opacity between 0 and 100. Click in the Opacity field and use the up/down arrows on your keyboard to set the opacity. The changes you make are reflected in the Stage view. Right-click a layer and select Change Layer Opacity. Select Layer > Change Layer Opacity. In the Change Layer Opacity window that opens, enter a new opacity.